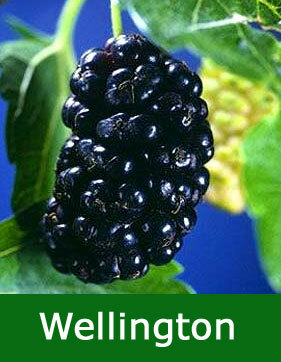 Buy Wellington Black Mulberry trees online FREE DELIVERY from UK specialist suppliers of garden fruit trees. The Wellington Mulberry (Morus nigra 'Wellington) produces large, attractive reddish/black mulberries and ripens before the Chelsea Mulberry. Our Wellington Mulberry tree is self-fertile which means it will produce fruits without the need for a similar plant nearby to pollinate the blossoms. The fruits are ready for picking late summer and they have a good flavour coming from a soft flesh. It is supplied at a height of between 1.50 and 2.40 metres in a container for year round planting and comes as a Half Standard or Quarter Standard which means it has been pruned early in the growing process to give more of an ornamental tree shape. We usually have several size and height options for the Wellington Mulberry tree, these being the 7 and 12 litre although at certain times of the year we have additional options in the 12 Litre. The options we currently have available will be the ones shown above this text. Below is an explanation of all the options that the Wellington Mulberry could come in. 5-7 Litre: Usually 100 to 150 cm, 1-2 years old and come as a Maiden (you can prune to shape as you require). If you are confused or not interested in the shape of the tree then go for the 12 Litre bush as you usually pay a little more for quarter and half standards. If you are looking to make an ornamental statement or want the most vigorous Wellington Mulberry you can find, go for the 12 Litre 1/2 Standard. Dear Alan and team, I'm sure you must have one! Just to let you know the Trev, or Trevor as we like to call him here in Surrey (or Sorry) depending on the 4 x 4 idiots, has arrived in fine fettle. He is looking splendid and is settling in to his new surroundings beautifully. We already adore him and he has quickly become a favourite in our little woodland. As you will see by the photos he has friends already. Pat, Monty and Amber to name but a few!!! He is still finding his roots but I'm sure with the possessive care he is receiving from Nick my husband, It won't be long before we start to see his true character, or divorce proceedings if the obsession gets any more out of hand!! !